Three people have been arrested as part of an attempted murder investigation after a hit-and-run in Derbyshire. 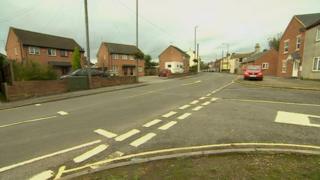 A 27-year-old man was struck by a car as he walked along the pavement on Derby Road, Ripley, at about 02:00 BST on Saturday. The pedestrian is in hospital in a critical but stable condition. Two men, aged 22 and 27, have been arrested on suspicion of attempted murder. A woman, 26, was arrested on suspicion of assisting an offender. Derbyshire Police said a silver Audi A4 may have been involved and has asked the public to report any similar cars in the area that have suffered damage.